Steven Alikakos is the President and Broker of Record of RKF’s Canadian operation. He has an exceptional track record and is recognized as one of the premier retail real estate professionals in Canada. Representing both retailers and landlords, Steven’s most recent tenant work has included Brooks Brothers, Zwilling J.A. Henckels, Andrews, Lacoste, Aqua Tots, Asics, Clarins, Earls, Christian Louboutin, Soul Cycle, WVRST, Ricarda’s, Impact Kitchen and Frings. He assists them all in their Canadian expansions, sourcing and securing the finest retail spaces on high streets, premium outlets and extraordinary malls across Canada. 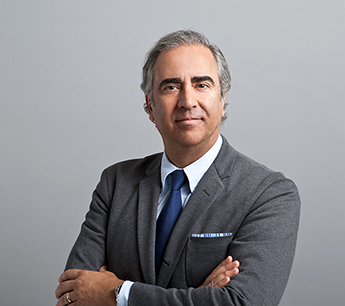 Steven has worked on several high-profile redevelopment projects in Toronto. Recent assignments have included the remerchandising of GWL Realty Advisors’ College Park, North York City Centre, Commerce Court and Southcore Financial Centre; Allied REIT’s REX Award winning ‘King West Central’, comprised of the Ground and Lower Floors of the restored Brick and Beam warehouses on King Street West, and their ‘Downtown East’ portfolio surrounding the historic St. Lawrence Market; CD Capital Partner’s retail at Yonge and Eglinton; Westmont Hospitality Group’s Fairmont Hotels across Canada, the redevelopment and leasing of Brookfield Properties’ Brookfield Place, Hudson’s Bay Centre, First Canadian Place, Queen’s Quay Terminal and The Atrium on Bay; Slate Properties’ Bay Street portfolio; and KingSett Capital’s Bloor Street portfolio. Most recently Steven’s team has been brought on to lease all the retail for The Well, RioCan and Allied’s new 3,000,000 SF development. Prior to joining RKF, Steven was Senior Vice President & Senior Manager at DTZ-Barnicke, where he led DTZ’s retail department across Canada. In addition to a variety of street-front leasing assignments in all of Canada’s best retail nodes, Steven worked closely with DTZ’s Office Leasing and Capital Markets Groups, providing his mixed-use expertise to many office and multi-residential buildings around Toronto and other notable downtown nodes across Canada. Steven is a member of the International Council of Shopping Centers and sits on the St. Lawrence Market Precinct Advisory Committee assisting the City of Toronto with the remerchandising and redevelopment of this historic Canadian complex.